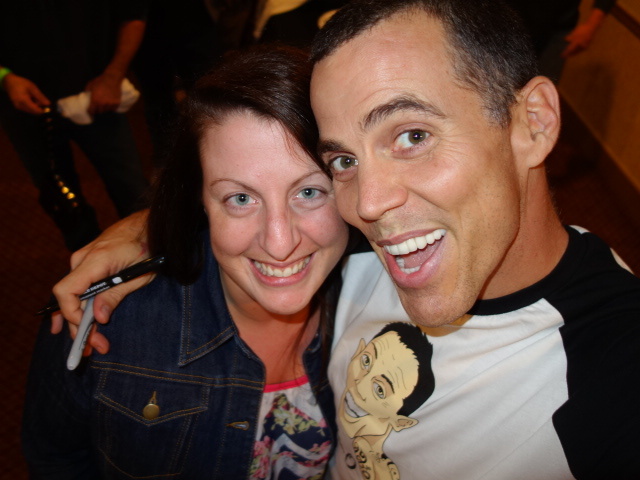 Ask Away Blog: So I Met Steve-O + 5 Reasons Why You Should Too! So if you followed me on social media last week you may have seen my posts about Steve-O!! That's right - the man from Jackass fame himself. By the way - Jackass is 15 years old. Meaning I was 15 when I first started watching it. WOW! Anyways, Steve-O came to Harrisburg Comedy Zone on October 1st and the cost was just $25 which was pretty cool because it made it possible for even those of us on a budget to go see him. Let me start off by saying I'm not really a "fan girl" of any celebrity but when I genuinely like and support a person it's because despite being entertaining - I like the person they are behind the scenes. I love that Steve-O has turned his life around and I support him every step of the way. I especially love how down to earth he is and he's definitely a celeb I have a lot in common with. So I figured since I always give advice on this blog I'd give you some advice on why you should totally go see him if you ever have the chance. It's SO worth it! Seriously, he said it a million times but he really means it. He knows that it's his fans and supporters that have got him where he is today and if you search his name on Twitter you will see lots of random fans that saw him on the streets, asked for a photo and got one. He takes the time to acknowledge people that recognize him in public which is pretty cool considering the fact that it could get old fast when you can't even go to the grocery store without being pointed out. Steve-O also responds to people's tweets. 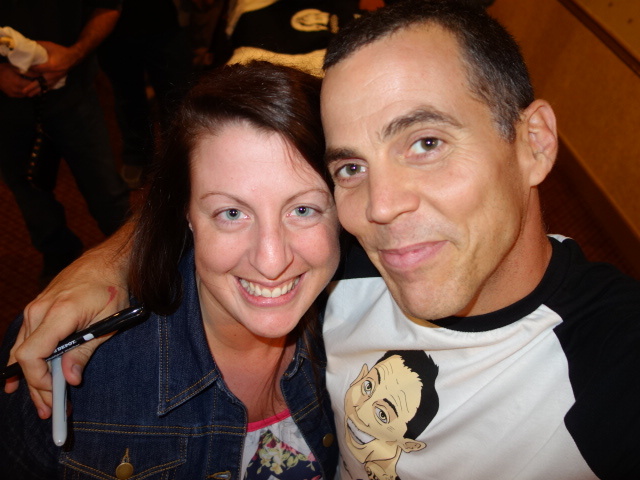 But that's not all - Steve-O loves his fans so much that at EVERY show he guarantees he will take a photo (with his camera) with each of his fans. And immediately after the show he uploads the photos to his website under Audience Photos. So after we got in line, got autographs and some merch we started to walk away and he finally got a look at me (it was definitely sensory overload for him that night since he went right from the stage to start meeting everyone) he said "Hey, I know you from Twitter!". I was totally stoked! As a blogger I've been connected to some big brands and a few celebs but none that I adore as much as him so I was so excited to know he saw my tweets and recognized me. I also try not to be annoying to people on Twitter but I have so many questions for people (especially after I read their books!) so I hope he doesn't think I'm obnoxious! Because I respect the work he put into his book and telling his story I will not spoil it but I really really do recommend you buy his book and read it. He literally has went through hell and survived, from drugs and losing his mom to alcohol and toxic people in his life. His book - Professional Idiot: A Memoir is pretty amazing. I read it in 2 days. Get it! Read it! You'll understand him as a person so much better. Not only is Steve-O a vegan but he has done several campaigns for PETA . He's also openly spoke out against Seaworld and whales in captivity, which if you remember my post about why I won't ever set foot in Seaworld again is a huge cause in my life. I hope that by the time I leave this Earth, something major changes which animals being held in captivity and it's so refreshing to hear a celebrity back that cause too! So yeah, anyways I was stoked that we have that in common and when he mentioned Seaworld stuff on stage I clapped so darn loud! Also, Steve-O loves his doggies and of course me being the crazy chihuahua lady I am loves that about him. Like I said - he's so down to earth! While he does have some raunchy jokes (which I enjoyed) I promise there's no puking and pooping on stage. I know several people were assuming he would be wild and crazy but he has definitely toned that kind of stuff down. That being said he was still hilarious and even had a few AWESOME tricks he did at the end. Unlike a lot of people that tried to take photos and video of them I will NOT spoil it so trust me when I say you have to see him for yourself! I mean he literally does need the money and he even told us that as a joke but it's pretty much because of his last stunt where he climbed to the top of a crane to protest Seaworld landed him in jail and with a HUGE bill for all of the ambulance, fire trucks, helicopter, and police that ended up on scene. Maybe not the brightest move you may think , but whatever - it got the job done and spread awareness about what's going on at Seaworld for those that may not have known. Anyways he has to pay the bill he received which is probably insane so come on - support the cause! Comedians that do stand up do NOT appreciate being recorded by the audience during their show. Not only does it spoil the show for future attendees but this is the way they make their money. They are entertaining a live audience - NOT to be recorded. Several people got called out for attempting to record him on their phone. This is one of the times my zen side comes out when I say just live in the moment and enjoy watching him - don't try to be all sneaky and get photos. Also, you can see his future tour dates on his website here. Seeing Steve-O was definitely a bucket list item! The only other thing that would complete my life is if I could get him to sign a Shammy blow up toy for me and somehow send it to me! Seriously though - my life would be complete. Steve-O's website has tons of awesome information and his social media channels are amazing! Have you ever seen Steve-O? If not, do you want to now that you read my recap? I literally haven't the faintest idea who this person is (I never watch television, maybe that is why). I saw him and wee man once and thy were both good. I respect Steve-o; he's really turned his life around into something positive. he really is!! He was so cool to meet too!